Bach holiday home, 2 Bdrs, 2.5 Bathrooms, sleeps 5, amazing sea/mountain views. The kitchen has a large fridge freezer with gas stove and hobs, with a massive solid concert island bench. The million dollar view, you'll be hard pressed to find anything like it on the Island. Unbelievable sea and mountain views, 5 min walk to beautiful white sandy Medlands beach. toilet, shower, Shower has sea and beach views. Both bedrooms in main house have balcony/desks. Four decks, located off bedrooms and main living dinning area. Main deck has gas BBQ. Wow.... 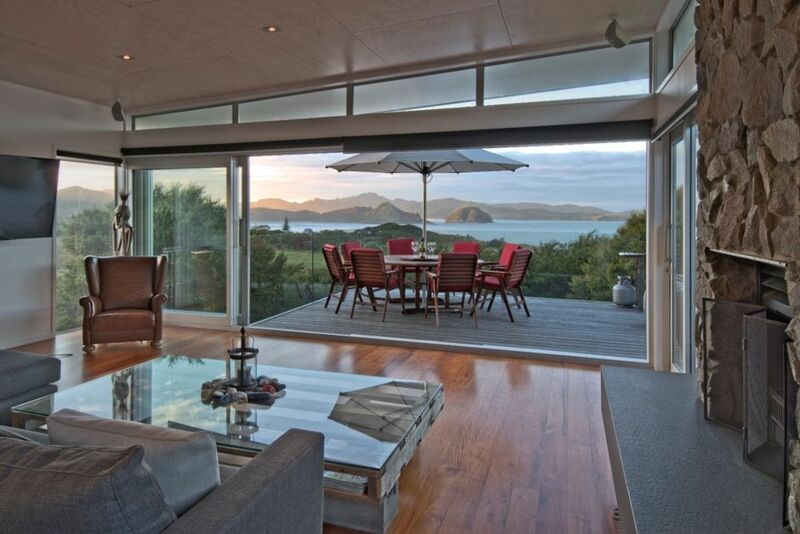 Awesome designer home, amazing location and view over the most incredible ocean beach and coastline. The beds were super comfortable, we had everything we needed and more. Perfect place for a break. The appointed Manager, Chris, was extremely friendly, helpful and extremely accommodating. We would love to be back at some stage in the future and can thoroughly recommend the property to anyone wanting some downtime from the hustle and bustle of Mainland NZ! - You will love it! I would categorize this special place as a rare gem. I would categorize this special place as a rare gem. There are a lot of accommodations which are very basic which you expect on an island. However, this luxurious villa will make you feel like the king of the hill with a view to die for! Very well maintained and you can feel the love the owner has put into his house. We stayed here with our parents and we had an unforgettable holiday. The walk from the camping up to the apartment takes 10 min but the view is very nice.